This page provides some basic, but very interesting statistics about category 5 hurricanes in the Atlantic basin since 1851. Category 5 storms are extremely rare. In fact, only 34* category 5 storms (~4% of all hurricanes) are found in the historical record. 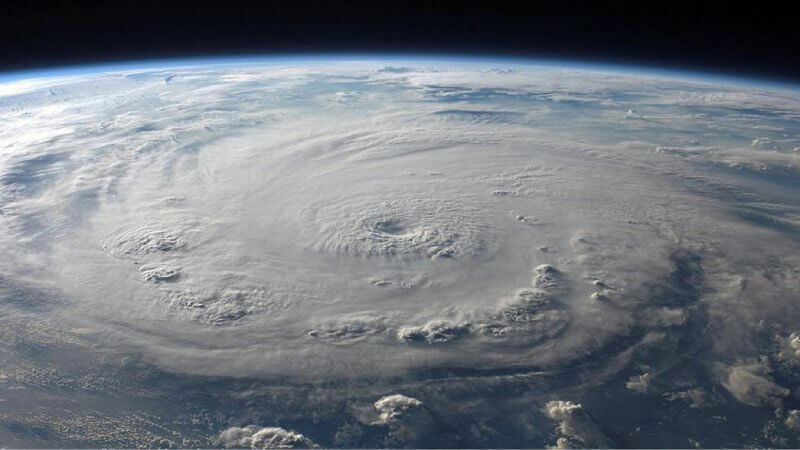 In the 165 years since records began (1851), there have only been six years that contained two or more category 5 storms; the most in one season was four in 2005 (Emily, Katrina, Rita, and Wilma). On the evening of Friday, September 30, 2016, following a period of rapid intensification over the Caribbean, Hurricane Matthew was upgraded to category 5 status — the first category 5 in the Atlantic basin in over 9 years (since Hurricane Felix in 2007). Prior to Hurricane Matthew’s upgrade, the duration without a category 5 stood at: 9 years and 26 days -or- 3314 days. This was the SECOND longest period on record. Note: The count begins with, and includes, the day after the last category 5 dissipated, ending with and including the day before the next category 5 developed. Hurricane Felix weakened from a category 5 on September 4, 2007, so the duration is counted from 9/5/2007 through 9/29/2016. Hurricane Matthew’s position and forecast path issued on Saturday 10/1/16 at 2 am EDT. Category 5 Hurricanes that “Hit” the U.S. Note: These storms were category 5 when they made landfall. There have certainly been other storms that were category 5 but weakened just before making landfall. An example is Hurricane Katrina which was a category 5 in the Gulf of Mexico, but weakened to category 3 strength prior to landfall. 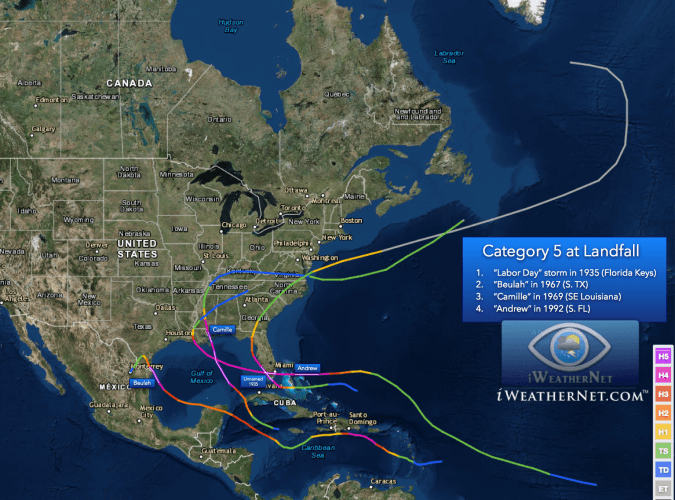 Map showing the four hurricanes that made landfall in the United States as a category 5. White line segments show the portion of the storms’ track at category 5. Note: Technically there have been 34 category 5 hurricanes in the Atlantic basin. However, the monthly distribution below adds up to 35 because Hurricane Matthew was upgraded to category 5 at 11 pm EDT on September 30 and was a category 5 into October; therefore, Matthew is counted twice. In the historical record, Hurricane Matthew is the only hurricane that straddles two months as a category 5. Note: For best viewing on a mobile device, view horizontally. Data pulled from the HURDAT database. 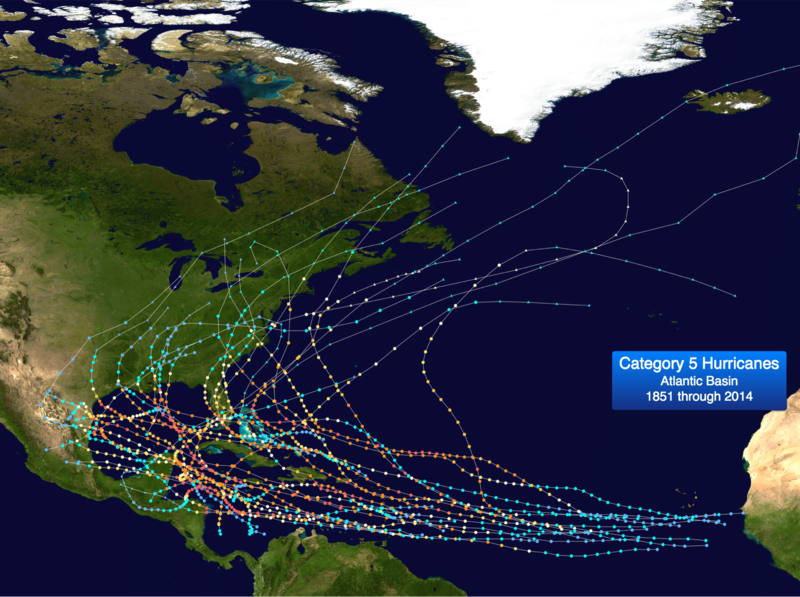 Category 5 Hurricanes 1851 to 2014.